The first time I saw the madmen, I was too slow on the button and they escaped into a narrow strait between the generators and a nearby warehouse. It took me a moment to realize what was happening - I was up top, photographing the last precious strains of a fading sunset through an industrial haze and smog, and had only noticed the activity below when I looked away from the lens - and before I could wonder what on earth they'd been doing climbing over the plant's security railings, I heard a low sound, a thrum in the earth, followed by a sudden and violent silence. I was shoved so hard backwards from the parapet and onto the rooftop that I hit my head on the brick floor, and lay there looking dazedly at the debris that showered over me. It's a wonder I didn't lose an eye, since half of the stuff was metal shards still too hot to touch. My hearing was gone, too, replaced with a constant, high-pitched whine. My photographer's instincts were intact, suicidal as they are, and as soon as I had my balance I rushed right up to the parapet again and started snapping pictures before I even knew what I was seeing. Whatever role the generators had once fulfilled, they were now rubble. A foul-smelling smoke emanated from their broken husks and I could hear live electricity flying about. I wasn't too worried about the camera, which was insured by my employers, but felt the usual mild concern that some kind of radiation from the accident might affect its memory or the backups that I'd had implanted in my skin. I always worried about this if I was doing active fieldwork, though probably less due to any valid reason - the memory chips are sealed from outside interference, and if I ever have to worry about the skin chips I'll likely have much bigger problems to deal with - and more over transferal of emotion. When you put yourself in the line of fire, time on end, all that anxiety of self-preservation has to be put somewhere, lest it eat you up from inside or turn you stupid and make you act like you're immortal. I had snapped a few shots of the smoking ruin when something on the warehouse wall caught my attention. I was too far away to see it with bare eyes, and the smoke still obscured most of it, but by zooming in and panning about I caught most of it. If it had been a regular painted tag I'd have looked past, ignored it and focused back on the wreck. Most graffiti is applied either with paint composites or, for the hipsters, with detachable projectors that cast all sorts of visual tricks. This one, on the other hand, had been applied with ScArdite, a highly flammable substance normally used to treat metal surfaces. It was sold in large, sealed containers but if you knew what you were doing - and didn't mind risking your skin and eyebrows - you could siphon it into pressurized containers. When applied in steam form to metal it would leave scorch marks that couldn't be missed. This one said, "Leave or die, Caldari". I snapped pictures of it, nicely framed by the surrounding smoke and debris. They were thoughtless images, taken almost at random by someone who'd been there purely by accident. A day later I was paid a high commission for the whole set, and two weeks after I was notified that the pictures would be set up in a prestigious current events exhibition. It was during this process I discovered the rest of what had happened: Those generators had fuelled security and auto-response systems over various areas in the city. Backup systems were in place, but they weren't sufficient to prevent a group of Gallenteans from sneaking about under the cover of encroaching darkness and assaulting both Caldari people and Caldari landmarks. The generators' destruction hadn't been a single and conclusive act of sabotage; it had been a call to arms. The world was worried. The news was the same, but news analysis, which is where you hear what people are thinking, was turning more and more jingoistic and paranoid. I didn't know anything more than anyone else but I could see that something was starting to go very wrong. I found myself thinking about those people. They'd wanted to send a message, and they had, but I wasn't even sure of what that message was, and neither were the pundits. The Caldari section of the populace was clamoring for the police to find, try and judge those responsible with the harshest penalties possible - this was Caldari Prime, after all, and we'd already suffered enough at the hands of the Federation - and demanded increased surveillance of Gallente youth. The Gallenteans, I have to say, took it all in stride, supporting our demands and agreeing with our politicians to whatever extent they could. But it didn't make sense. A concentrated effort like the generator sabotage took planning and resources, if one ignored the stupid tags they'd left behind. Something like that was done with a clear and direct purpose in mind. You shut down power, you robbed the bank, and you escaped. The outcome of this, the assaults and property damage, wasn't a crime in the traditional sense; it was a generalized and violent political message, something you'd expect from a group of animals too stupid to know what else to do. I couldn't stop thinking about it. I found myself visiting the landmarks they'd defaced and walking through the areas where they'd hurt all those people. I figured it might make for a good series of follow-up images but in truth I was doing it more for myself. In each space I found something familiar, in that way I can never quite explain. When you take pictures you're dealing with three layers of reality: That which can be seen and is what it is, that which can also be seen but represents something else, and the dark limbo in between that's so abstract you can barely identify it at all. Fiction has the first two - storyline and metaphors - but usually lacks the third. It is the framework, the organization of everything so that it can tell its story; a meta-layer of conveyance. And I saw it, the same thing, in every one of those locations. There was something about them that made them stand out. From a simple public park to the most imposing of Caldari monuments, it was there. This setting, light and lines, that gave an area its unmistakable flavor. This framework. Whether the attackers had known about it, I had no idea. But I was a photographer and I'd wandered the streets of this city for a long time, long enough to know where else to find moods like this. Probably I should have called the police, told them I had a suspicion of where they'd strike next. And probably they would have laughed, and thought I was some artist with an ego. Or they might have listened; I don't know. I remembered a place in the city, one of many monuments to the fall of our planet. It had the same feel as the ones I'd seen, and it also had some nice vantage points where a person might hide out. That same night I stocked up and took my gear to one of those vantage points, where I waited all night for something to happen. I was nervous and jittery, and would snap an image at the least little thing. In early morning I left my spot, tired and frustrated, but relieved, too; not merely for the sake of the monument but for my own. I was between assignments and still felt too attached to the sabotage, so I slept during the day and returned to the same place the night after, with better equipment and a more patient attitude. It served me well. That night they came. The pictures caused an outrage. It was a proper series this time, from start to finish, that documented how a group of Gallente utterly reduced a Caldari monument to smoking ruin. Some of them - the ones who'd used acid and other things - wore gasmasks, but the group otherwise seemed entirely unconcerned with identification. At the end, they even pulled down their pants and urinated all over the remains of what they'd destroyed. I had another exhibition during which someone asked me in fairly shocked tones why I hadn't done something. I kept a cool demeanor and asked what I should have done, alone, against a group of rampaging, violent criminals. My interrogator's spirit was dampened somewhat at this, so I put my arm on his shoulder and explained that sometimes all we could do was tell the others, to make sure society could see what was happening in its midst, and leave the rest up to the people in charge. He was mollified at this, though I don't think for a second that he truly thought any action would come of what was being displayed on the walls and in mid-air. It was a personal insult to him, what he'd seen in my pictures, and he was less concerned about society than his own fragile bubble inside of it, for if someone would do this to cherished and well-established landmarks of the city, someone might well take it into their head to go after its cherished and well-established patrons, too. Everything is personal, in the end. This wasn't the first time I'd done war photography. Of course, in my head everything with violence in it could be called a war, the only difference being one of scale. Those people who maintained that a picture of mad dogs fighting in backyard matches was different from spaceship armadas launching torpedoes and ammo volleys at one another were really only deluding themselves. And as I looked at my own pictures, hovering there so gargantuan they blotted out the rest of my sight, it began to dawn on me that the raw power of this particular series - that unnamable framework - wasn't drawn forth so much by the violence that I'd seen a million times before, nor whatever political machinations might lie behind, but by my own emotional response to it. I could see it in the angles I had taken, the lines I had cut without even realizing it: the pictures were in perfect harmony not merely to the actions of their subjects, but to the situation itself. A situation that I had let myself become part of, both physically and emotionally. I had all but put myself in front of the lens. It wouldn't be the last time, either. I had known where they would be and deep inside I felt a quiet reassurance that I also knew where else they would go. That budding realization, that this possibly hadn't been a fluke but instead a recurring relationship between me and these mad dogs, excited me beyond measure, and frightened me more than I can possibly explain. I began hunting them, as one would stray animals. The framework was always there, waiting for me to find it and settle down to wait. It amazed me how they didn't seem shy at all. They truly were like animals, acting out their nature unashamedly and with great vigor. Not that they had nothing to fear, for the authorities were after them in force, but they were good judges of any situation and responded to real threats rather than nervous imagination. A slaver hound will without hesitation tear apart a human being, taking its time to eat the flesh and muscle, and so long as you don't get between it and its meal it won't care at all that you're near. The waits got shorter and I began to know their patterns so well that at times I could swear they were practically leaving me signs for where they'd strike next. Most of the images I took, I didn't even release myself. Aside from growing police interest in me, there's a limit to how much a client or exhibition hall is willing to pay a single photographer, and I'd long since set up various fake middlemen for those occasional times when I was especially productive. Public attention in their crimes rose accordingly and hit such a fever pitch that I could afford to devote myself exclusively to the subject. I could probably have afforded a nice, long vacation as well, but as time passed it became less about the job and more about the hunt. There is a special flame that lights inside you when you spy the perfect framework, that dead limbo you want to capture forever, and I needed to keep it lit. In fact, it had all been going so terribly well that what happened during my last session has robbed me of sleep and all peace of mind. It was near sunset, my favorite time of day. I was high up in a disused building on the edge of town. It overlooked a trickle of a river, on the other end of which was a cemetery with a special plot for war veterans. I'd been there on and off for almost sixty hours, but between my thermo mattress and some quite pleasant instant meals it was all right. My sleep was peaceful and rested, and motion scanners warned me of any possible appearances. It had been a few hours since I'd set up my gear and settled into that pleasant meditative state when one of the scanners pinged and I snapped to attention. They came quietly, disabling security and pouring through the gates. I couldn't help but admire their movements; they looked so nonchalant and purposeful all at once, a hungry pack out on a hunt for easy prey. The group moved directly to the veterans' quarter and I felt the familiar trickle of excitement on my skin. With luck they would do their work before the light ran out. At no point did I feel responsible for their actions; they were repulsive, and my excitement was always tempered with disgust at both them and myself. But that didn't stop me from shooting pictures. And there must have been a glint from my lens, because even as one of them was straightening up, having defaced a Caldari grave in ways beyond comprehension and taken off his gasmask, he turned around with a bright blue smile, and he looked towards the abandoned building, and over the vast gulf of that dead limbo we suddenly both inhabited he looked directly into my eyes. I felt my blood freeze. My mind turned in on itself, trying to comprehend what I'd just seen and whether it had been coincidence. I didn't even consciously see him any longer, though I kept shooting on instinct . They finished their task and the man never looked my way again, but long after they'd gone I lay there, trembling, rationalizing to myself the way someone does when they've long since crossed the line and now look back to see where it was. For this framework, this dark limbo between reality and deeper meaning that I've been hunting all my life, is more all-encompassing than I ever imagined. When I got home and inspected my pictures, I saw it. Another thing I know about animals and respect them for is that they don't take a conscious decision to participate in whatever horrible acts they perform. It's instinct at most, but never calculated intent. The outcome looks much the same one way or another, but the reason matters. It matters to me. My pictures are growing more and more popular, and I've sold them in the firm belief that I am merely a chronicler, nonexistent and outside the framework they convey. But I was so wrong. And yet I am going to keep taking them, because I must. I have become part of these events, and if I stop, then they will cease to exist, and so will I. The framework includes me, as it always did. I have in my home a picture that I will never show to another human being. It shows a Gallentean, his face so nondescript I can barely describe it once I make myself look away. Beads of sweat are glistening on his countenance and the defaced gravestone by his feet bears the marks of the small drill in his hand. 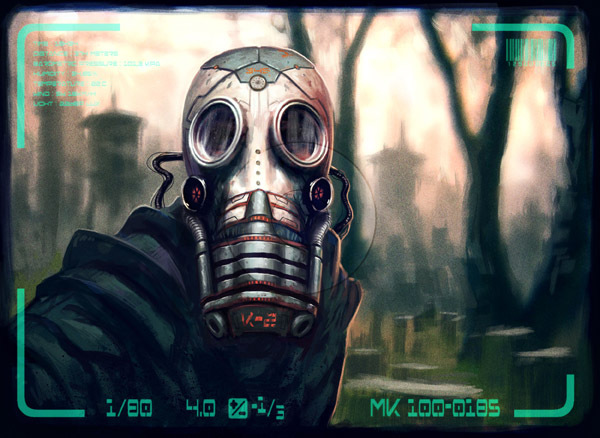 In his other hand he holds an empty canister of acid, droplets spilling from its edge and onto the grass below, and on the ground before him lies a used gasmask. He looks happy. He has just poured the jug's content all over the earth on which he stands, and the smoke that arose to envelop him has been blown to the winds. Soon the acid will seep even deeper into the ground, find its way to the bones buried in there, and dissolve them, leaving behind only a blackened, foul-smelling tar. He is staring into the camera, one animal acknowledging another, and he is winking directly at me.